The race for County Legislature 14, most of the eastern half of Dryden, is between a conservative Democrat and a conservative Republican, between two candidates who bring considerable if very different experience to the table. I'm delighted to encourage voters to support Mike Lane. It seems like every time I ask a question of someone about Dryden - whether it's history, government, or people - the quick answer is "ask Mike Lane." Mike's committment to the community stands out not only in his government service but also in his participation in local institutions like the Southworth Library and the Dryden Town Historical Society. 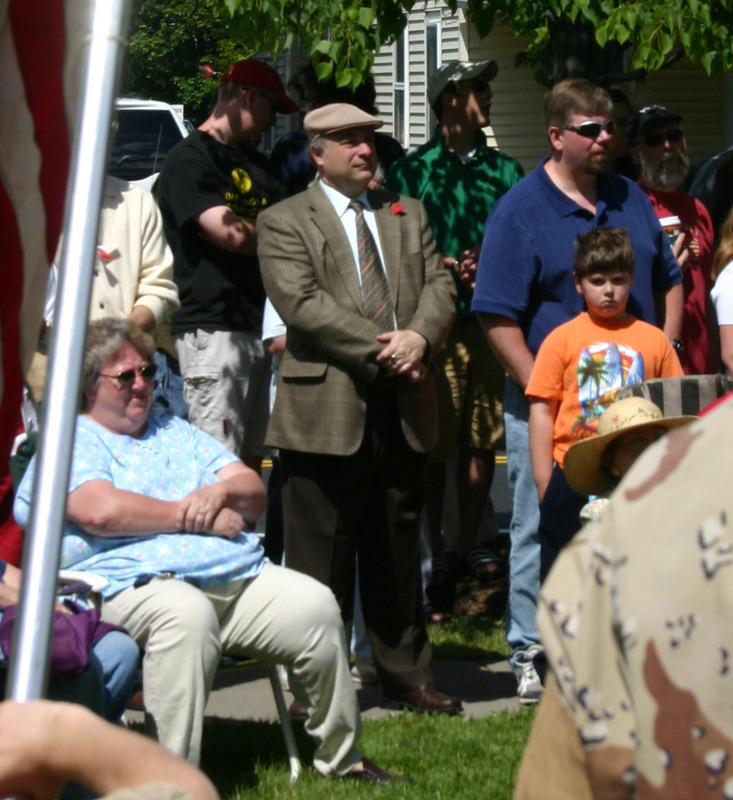 County Legislator Mike Lane (center) attending the May Memorial Day ceremony. Despite the best efforts of Mike's opponent, and of the Coalition for Change, even a quick glance at Mike's voting record makes it very plain that he has his own perspective, very different from Ithaca-area legislators and especially from the Chair of the Legislature. I've written innumerable Living in Dryden stories where Mike voted differently than his colleague to the west, on a wide variety of issues. Mike's record is both responsible and fiscally conservative. If you'd like hard numbers on his fiscal conservatism, check out this tabulation of 2005 budget votes (45KB PDF), where Mike turns out to be the third thriftiest legislator, well ahead of his Republican colleagues. Mike also understands where spending pressure comes from, and I was happy to see him present data on other counties' taxation to the Town Board in September. Mike's also focused on projects that bring new business to Dryden and the surrounding area, which explains his interest in the Industrial Development Agency (whose board he chairs) and in ensuring that an Empire Zone appears in the area north of the Village of Dryden as soon as the state will allow. He also works as liaison to Tompkins-Cortland Community College, an institution he sees as critical to the area's economic growth. Mike's commitment to his community and his faith in its continuing ability to improve have impressed me repeatedly. Mike offers the best of Dryden values, respecting the views of everyone in the community while striving to reconcile them. It's a difficult set of challenges, but I think Mike's ability to listen and respond are exactly what Dryden will need for the next four years.